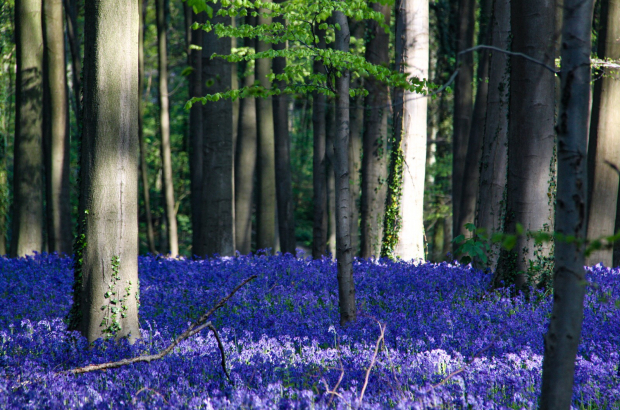 The Hallerbos on the outskirts of Brussels is getting ready to welcome tens of thousands of visitors for the annual flowering of the bluebells. The forest in Halle, Flemish Brabant, encounters a surge in visitors when it is covered in a purple carpet of bluebells, which should be in full bloom by mid-April for about three weeks. "But it depends a lot on the weather conditions," said Filip Hubin, spokesman for the Flemish Agency for Nature and Forest, which manages the site. "If the sun begins to shine now, flowering will probably start sooner." The natural phenomenon has become a major attraction for tourists and locals alike, leading to concerns about the state of the forest. The agency is seeking 40 volunteers to help manage the flow of people. "As well as informing visitors, their job is to educate them to stay on the paths," Hubin said. "Some people think that they can picnic in the middle of the flowers or take photos while trampling on them." Many walking paths criss-cross the forest, and there are several signposted walks from two to seven kilometres. From 13 April, transport operator De Lijn will launch a free shuttle bus from Halle station to the woods over three consecutive weekends, subsidised by the Flemish region to the tune of €25,000. The free bus will also run on Easter Monday and the 1 May public holiday. "For people who do not come on foot or by bike, the bus is the best way to get to the wood," Hubin added. "Traffic will be very heavy, especially as the Vlasmarktdreef, which runs through the woods, will be closed to traffic."